that they should believe the old Romney, not the fake new one. I thought this worked pretty well, but then, I would, wouldn’t I? Transcript here. For my money, the worst moment of the night for Romney came on Libya. He hauled out a stale conservative talking point about Obama not calling the Benghazi attack an act of terror, and when he confronted Obama about it, Obama just smiled and let him hang. Unexpectedly, this flustered Romney. Then, a few seconds later, Candy Crowley interrupted to confirm that Obama did, in fact, call it a terror attack the very next day. That really flustered Romney. This is the kind of segment that ends up getting repeated on cable news over and over and over. Obama had a pretty good line early on about Romney’s economic views: “Governor Romney doesn’t have a five-point plan, he has a one-point plan. And that plan is to make sure that folks at the top play by a different set of rules. That’s been his philosophy in the private sector, that’s been his philosophy as governor, that’s been his philosophy as a presidential candidate.” I wish Obama had had a chance to hammer that a little harder, but it never really came up again until the very end. On taxes, Romney has talked before about the idea of capping deductions rather than eliminating them, but this was by far the most public forum in which he’s mentioned it. For all practical purposes, I think that makes this the official Romney position: A 20% across-the-board rate cut paired with a $25,000 maximum for itemized deductions. The math on that comes nowhere close to working, though, and it’s pretty easy to prove it. I wonder how long it will be before the Romney campaign backpedals on this? Obama did a good job of hitting Romney on his tax plan, taking it slowly and all but accusing him of deliberately trying to deceive middle-class voters. It’s hard to know if this made a dent, though. Too many numbers just puts people to sleep. Oddly enough, I think both candidates did better tonight than two weeks ago. Obama was, obviously, way better. I’d give him an A-. But Romney was better too. I’d probably give him a good B, maybe even a B+ if I were feeling generous. I don’t know how much the first debate really affected the polls, but if it did, this one ought to correct at least some of the damage. Obama’s the underdog! The fate of Western civilization rests on his debating skillz! Let the liveblogging commence…. 10: 39 – And that’s a wrap. 10:32 – Obama answer on China is getting kind of wonky. 10:26 – Question for Romney about outsourcing to China. I hope Obama doesn’t repeat his “Romney invested in Chinese outsourcers” wheeze when he gets his rebuttal. 10:24 – Everybody agrees on importance of parents! Hooray! 10:23 – Now Candy Crowley asks Romney why he changed his mind on assault weapon ban. Ouch. 10: 22 – Romney playing to the base with Fast & Furious nonsense. 10:20 – In the end, however, Obama mildly in favor of renewing the assault weapon ban. Romney flatly opposed. 10:18 – A gun question. Obama playing it right down the middle. 10:17 – Romney flustered when Obama refuses to answer him. Then Candy Crowley fact checks Romney in real time! Crowd claps! This might be the highlight of the debate. 10:14 – Obama offended at suggestion that his diplomatic team might be playing politics with attacks. Pretty good response. 10:13 – Romney is dissing Obama for attending a fundraiser the day after the Benghazi attack? That’s pathetic. 10:12 – This is pretty much the first real foreign policy question, isn’t it? 10:11 – Question: who screwed up security in Benghazi? Obama: We’ll get back to you. 10:07 – Crowley now getting annoyed. Obama getting into a tiff over rules. I don’t think that works, no matter how justified. 10:05 – OK, now Romney switches to “self deportation.” His explanation: “Let people make their own choice.” Sounds so cuddly! 10:04 – Romney just totally blows off Candy Crowley when she tries to ask a followup. 10:02 – Obama has a very nice, crisp answer on immigration. 9:59 – Romney pretty tough on illegal immigration. No more Moderate Mitt. I guess focus groups showed that this was a winning position. 9:56 – Romney pretty crisp when attacking Obama’s first term. Both guys actually seem more comfortable arguing over past four years than upcoming four years. 9:53 – Obama on Romney and the GOP Congress: “He said ‘Me too. '” Repeated over and over. Decent line. 9:51 – Obama is in his wheelhouse defending his past four years. Not sure that will get the job done, though. 9:49 – Maybe I missed something. I thought the Bush question was about wars etc., but maybe I misheard. 9:48 – Wait. “I came through small business”? Is Romney talking about Bain Capital? 9:46 – “What is the biggest difference between you and George W. Bush?” Question is about foreign policy, but Romney just goes back to his five-point plan. Totally evading the question. 9:41 – Romney’s answer about women seemed vaguely condescending to me. Wonder if it came off that way to anyone else? 9:37 – Crowley cuts off tax discussion just as it starts to get interesting. Of course, not everyone might think tax discussions are as interesting as I do. 9:34 – Obama now getting a little too deep in the weeds. But decent attack anyway. Romney responds on his tax numbers: “Well of course they add up.” Then pivots away instantly. 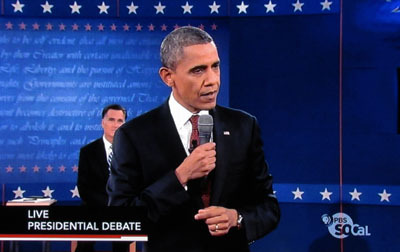 9:32 – Obama calling out Romney on deductions. Good attack, but will it work? 9:29 – Hostage talk from Obama. Excellent. 9:26 – Ah. Romney going public on the idea of capping deductions, this time at $25,000. Math still doesn’t work, but this is now getting close to being his official position. Also, really doubling down on not cutting taxes for the rich. 9:19 – Conservatives sure are obsessed with drilling on federal land. 9:16 – Trying to paint Romney as anti-coal probably not a good idea, especially after accusing him of being Mr. Coal. 9:15 – “Moderate Mitt” is back. He loves renewable energy! 9:14 – Obama hammering on green energy. Good. 9:11 – Romney is right that Obama took GM through bankruptcy. Obama is right that Romney’s plan wouldn’t have worked. Obama: “Governor Romney doesn’t have a 5-point plan, he has a one-point plan.” Good line. 9:09 – Romney trying to pretend “real” unemployment rate is 10.7%. Spare me. 9:07 – Obama going with a numbered list for his jobs plan. Good move. Then a shift to taxes. 9:03 – Romney seems to have sat down on his barstool OK. Whew! 8:59 – Here’s hoping that Candy Crowley ignores all the weird rules the campaigns insisted on during pre-debate negotiations.